Offer extensions are now available and can be shown in the UK. 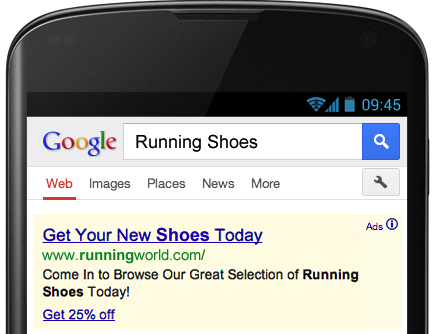 Improve campaign results using location bid adjustments, whether your customers buy online or offline. More easily reach customers that are near your business locations. 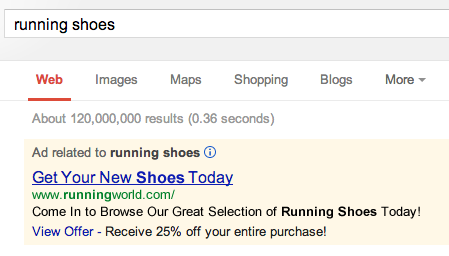 Drive more offline purchases and measurable in-store traffic with search ads using offer extensions. For a guided walkthrough, tips and Q&A on using these new location-based features and offer extensions, please register and join us at this week’s Learn with Google webinar on enhanced campaigns this Thursday, March 7, at 10am PST. Whether your business is online-only, offline-only, or multi-channel, you can improve your overall results by using a broad location target to cover your entire potential market while refining your bids in select areas. With legacy campaigns, you’d need to set up a new campaign for every location you wanted to bid differently on. Now, with enhanced campaigns, it’s simple to increase or lower your bids by a certain percent for any location target in your campaign. In the AdWords interface, click Locations on the Settings tab, and then click on the bid adjustment column to the right of a location target to increase or decrease your bid. 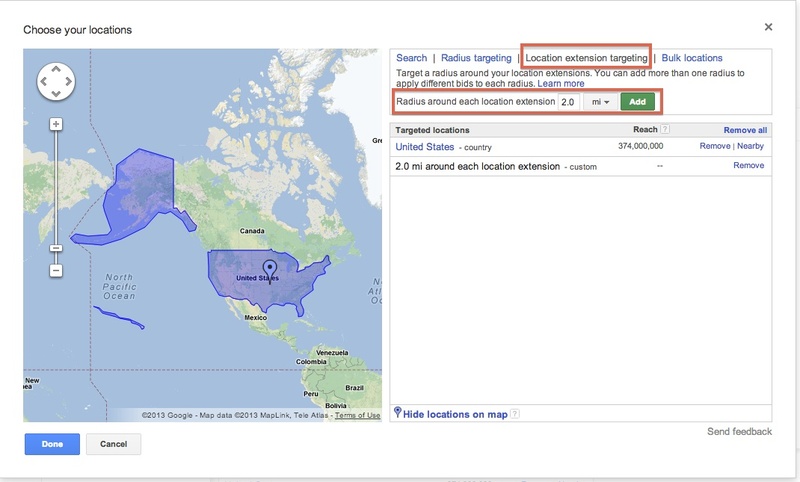 You can also make location bid adjustments with the latest version of AdWords Editor. 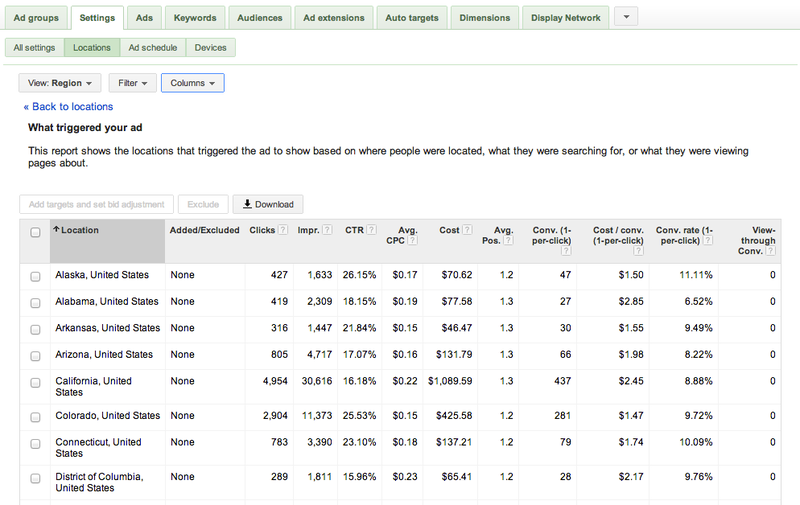 Toggle the View button to slice your campaign performance data, including conversion data, by different geographic levels (example screen). Sort or filter to focus on the locations you want to optimize. Click the “Add targets and set bid adjustment” button. For more advanced optimization, you might pair your AdWords reporting with your company’s data on customer value by geography to adjust bids for different locations. Example 1: A commercial maintenance company targets a 20 mile radius around downtown Denver. The marketing director might know that it costs 20% less to sell to and service customers who are within 10 miles of downtown. He can improve his results by increasing his bids by 20% for customers within 10 miles of downtown Denver, since these leads are more profitable. Example 2: An online-only financial services company has modeled its average customer lifetime value by zip code. The company’s search specialist has been asked to achieve an average 8:1 return on ad spend (ROAS), which they define as average lifetime value divided by average cost per lead. The specialist downloads data from AdWords with cost per lead by zip code and pairs it with lifetime value for each matching zip code (example data). She looks for opportunities to improve her results by lowering bids in zip codes where ROAS is below the target and increasing bids in zip codes where ROAS is above the target. She makes her bid adjustment decisions in the spreadsheet and implements them in her enhanced campaign, re-checking the ROAS and volume impact for a few weeks and making changes as necessary. With legacy campaigns, she would have to set up a new campaign for every zip code with different bids, increasing the level of campaign management complexity and effort required. Experienced search marketers know that bids are an important contributor to campaign results, along with ads, extensions, keywords, and landing pages, so they’re sure to measure periodically and make adjustments. Remember, targeting too narrowly can limit your reach, clicks and conversions, so consider using selective location bid adjustments while targeting broadly. More tips on optimizing your campaigns using location are available in the AdWords Help Center. If you operate an offline or multi-channel business, you can use the new location extensions targeting to reach potential customers or increase your bids when they're near your locations with just a few clicks. It uses the location extensions you’ve already created and a radius that you specify to create targets around your businesses. 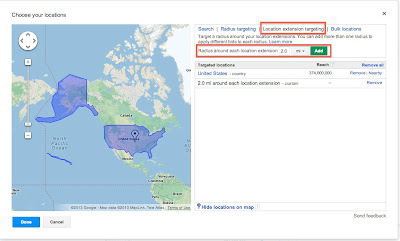 You can then assign a bid adjustment to your location extension target to increase your ad’s visibility when customers are near your business, and potentially more likely to shop and buy from you (step-by-step directions). 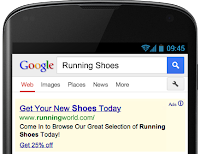 Example 3: A national multi-channel retail business has been running AdWords campaigns to sell directly online and to drive people to its 400 local stores. The account has already set up location extensions, but it wants to improve its ad visibility even more when customers are searching within a short distance from its stores. With just a few clicks, its search agency adds a single “2.0 mile around each location extension” target and sets a +25% bid adjustment. Showing a potential customer the right offer at the right time can be the difference that brings them into a local business to buy from you. 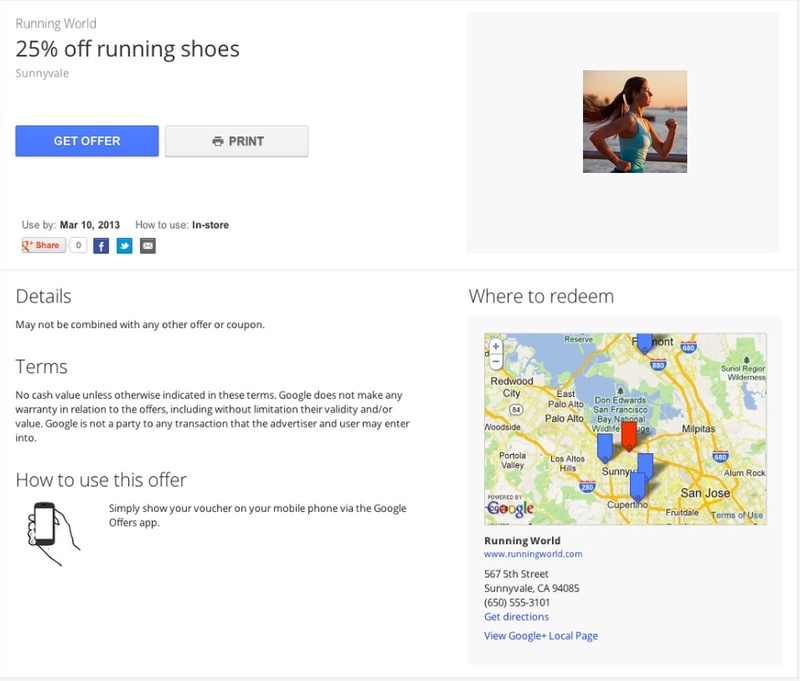 Offer extensions help you drive offline purchases and in-store traffic with a redeemable offer shown with your search ads across devices. You can use them whether you’re a retailer, manufacturer, or other type of business (currently shown to users in the U.S. only). When customers click your offer, they'll see your offer details, business logo, and nearby stores (see example below). They can print your offer or save it to their Google Offers account for in-store redemption. At the point of sale, customers redeem the offer using either a text code or a bar code. You pay for clicks on an offer just like a click on your ad headline – there are no fees for each redemption. We’ll also remind customers about unused offers through email to improve the redemption rate. Offer extensions are available at the campaign or ad group level. Check out more details and tips on offer extensions usage and reporting in the Help Center. Please stay tuned for more details on the availability of offer extensions in other countries and improvements with offer redemption reporting. We welcome your feedback on these features and others in enhanced campaigns using this form. April 11 update: Offer extensions are now available and can be shown in the UK.